Invisalign is the ‘invisible’ way to straighten teeth without the need for metal braces or wires used in orthodontics. 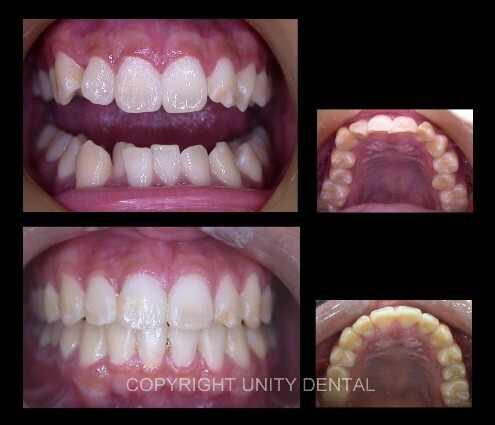 Using a series of clear, removable aligners to gradually straighten teeth, Invisalign combines 21st century technology and revolutionary manufacturing to customise a treatment for each individual patient. Each aligner should be worn for two weeks, before you move onto the next one in the series: gradually moving your teeth little-by-little until they reach their final destination. Along the way we’ll keep a close eye on your progress to make sure everything is moving correctly and in the right direction. For the best results it’s important to wear your aligners for between 20 and 22 hours a day – just take them out for eating, drinking and to brush and floss your teeth. Luckily for you, this means you can continue to enjoy all your favourite foods throughout your treatment, as well as keep on top of your oral hygiene routine: ensuring a healthy, beautiful end result. Unity Dental is a Certified Provider of Invisalign.